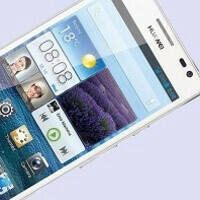 The Huawei Ascend D2 might not have gotten as much of the press love and attention as the Sony Xperia Z, but with a 5-inch 1080p display, an aluminum body and dust and water resistance it deserves every right to get users love. And now, merely a week after the phone was shown to the world at CES 2013 (but still months after its official unveiling in Asia), the Huawei Ascend D2 has now launched in China. China Telecom customers can now get the Ascend D2 for an off-contract price of $640 for a dual-SIM version of the device. Expectations are for Huawei’s flagship to arrive to other countries in March. Freshening up your mind about the Huawei Ascend D2, it has a 5-inch IPS 1080p screen, a quad-core 1.5GHz processor, a 13-megapixel BSI camera and a 3,000mAh battery. All of this fits in a 0.39-inch (9.9mm) thick body, and the phone runs on Android 4.1 Jelly Bean. For a phone that's Huawei claims is in the same league as Samsung, this phone is too thick for a flagship device. Even the Samsung Galaxy S2, the phone with the "it" factor from 2 years ago was 9.1mm thick. Honest opinion, the HTC Droid DNA is a far much better phone than this, you can tell by build quality and how much work has gone into the UI. Huawei should just stick to making crappy phones like Huawei Ascend, man that phone was an abomination-- a sad excuse for a phone. Its battery is a 3000mah. Either this or a case to extend battery life. Well, Ascend D2 is dust and water resistent, has better IPS screen, has 2x bigger internal storage (32GB), also has native HDR support in camera, and most importantly 50% bigger (3000mAh) battery. hater's gonna hate. good, you like htc then go there. dont come near huawei ever again. people like you should just get back into your cave! That's one setback. Luckily it kicks of with 32gigs. Looking forward to performance tests, it's HW's own quad-core. This baby left the most impression on me. 13MP HDR camera, 3000mAh battery, promised Android 4.2 upon launch (don't think it's ready quite yet) - dustproof, shockproof, waterproof and lasts long for a fair price what more do you want? "what more do you want?" A very good aftersales/update program or the option to go back to the plane Android os. I live in the Netherlands (Europe) and Huawei isn't known for it's update service in Europe.... I've bought a Huawei Ideos S7 tablet a couple of years ago, but there was never a update released. It still runs on Gingerbread 2.2.1. but only because I was able to root the device and updated it through a Indonesian site which had provided the Gingerbread 2.2.1. upudate. Officialy it never got the update in Europe. Even on their official website there never was a update for any device sold outside their homeland. So I will think twice before I would buy any Huawei device again. 2.2 is Froyo, not Gingerbread. All that I've got to say is that the Samsung Galaxy S4 is going to blow this phone out of the water since AMOLED, green panel, and bendable YOUM screens use less power consumption plus are all at Samsung's disposal. Aside from that, Samsung might just feature the octa-core it presented at CES.